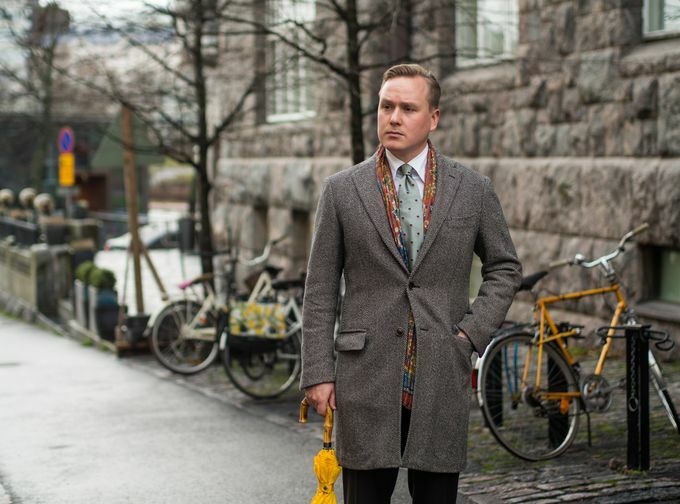 Today's autumn inspiration comes in the form of some versatile business wear. 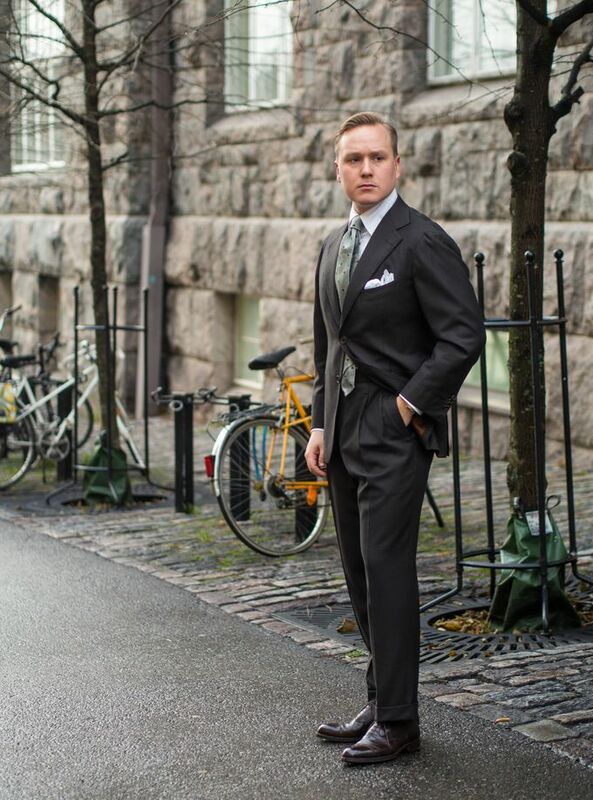 A bespoke made in Naples suit combined with classic accessories and dark brown Oxford shoes. 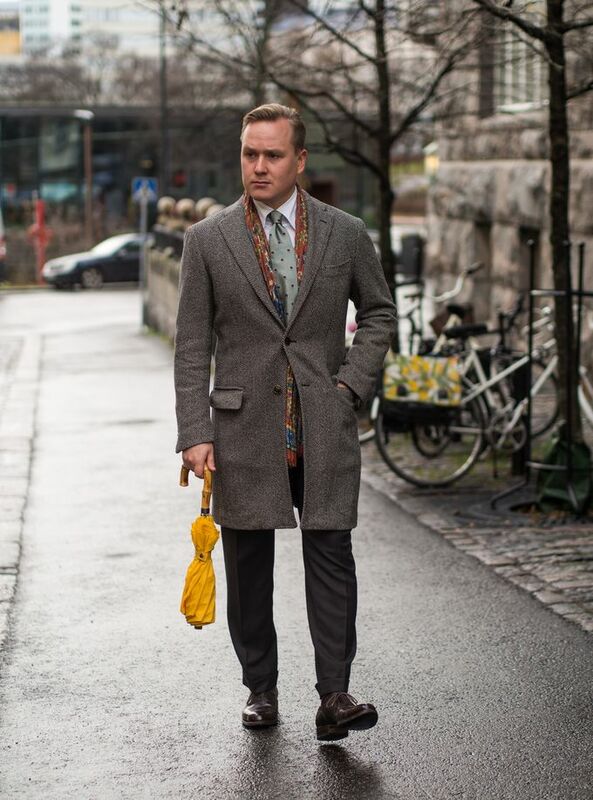 In essence, this is something I personally would wear to almost any business occasion during the colder seasons. The worn items include my bespoke Peluso suit from brown VBC birdseye wool fabric, one of my unique vintage jacquard ties, a mtm shirt from Vaatturiliike Sauma, artisan pocket square by Simonot Goddard, braces by Albert Thurston, socks by Mazarin, mto shoes by Vass Shoes, coat by Ring Jacket, scarf by Drake's London and umbrella by London Undercover. 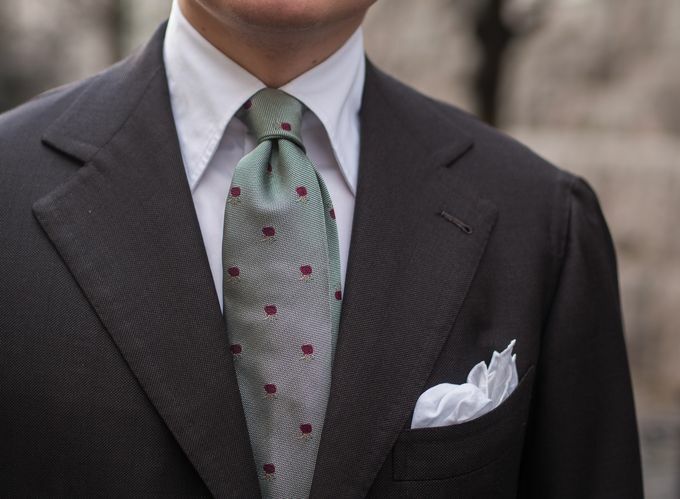 So, like the jacquard tie in my last post, this one is a similar one-off piece after my own design. In a way, it is a result of me trying out different constructions and weights in this jacquard weave. 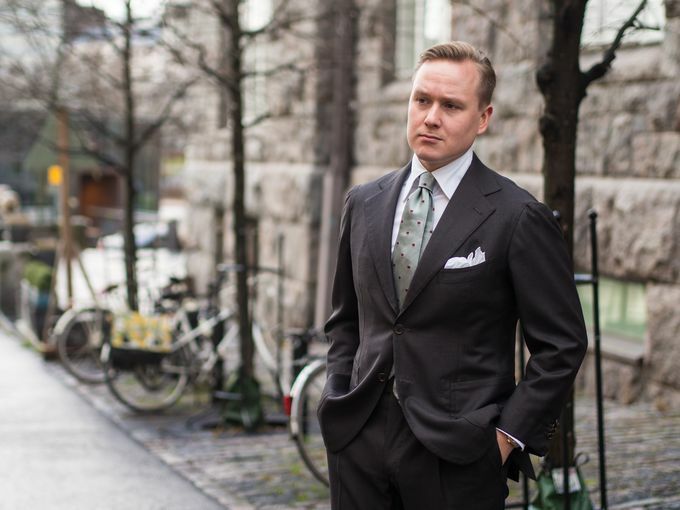 This particular tie is in 8.5cm width and has been made in a five fold unlined construction. 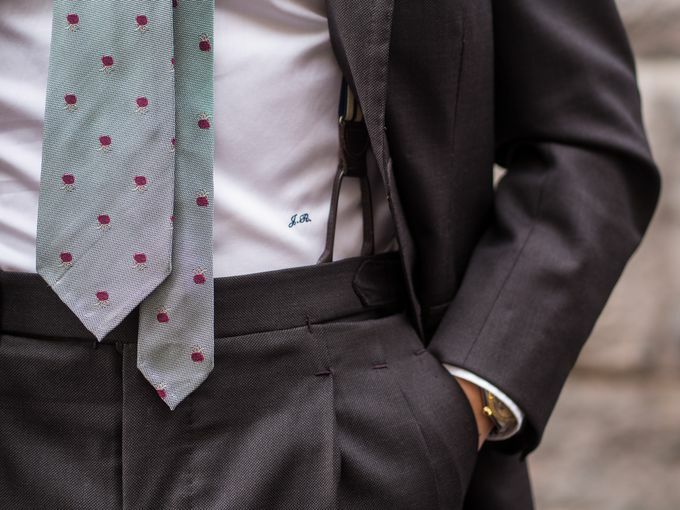 It is my favorite of these pieces and hands down one of the best if not the best jacquard tie I've ever tried or owned. A really fantastic 3d feel and airiness to it, it also ties perfectly every time. 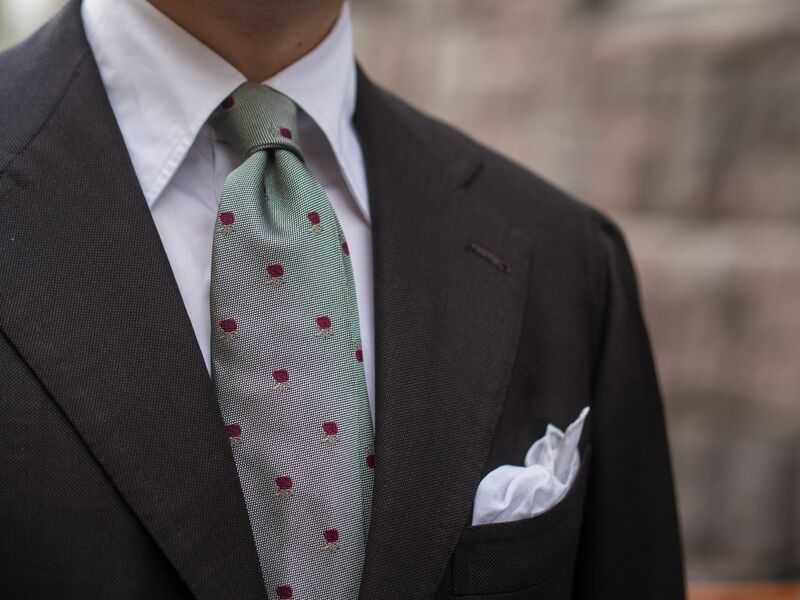 In its very old school design and color palette, I think it's quite a perfect match for this equally classic old school Neapolitan suit by Pino. Pino Peluso's style is definitely on the classic end of menswear, and also in the classic and traditional end of bespoke tailoring that comes out of Naples. The lines are full and the proportions very classical. No super high waist or super low buttoning point that can be quite common on the more trendy (in the world of classic menswear) end of our scene, instead very moderate proportions that I feel are very optimal for my body type and length. The shoulders have a lovely character to them and in general the jacket is by far the most comfortable and nicest-to-wear jacket I have. 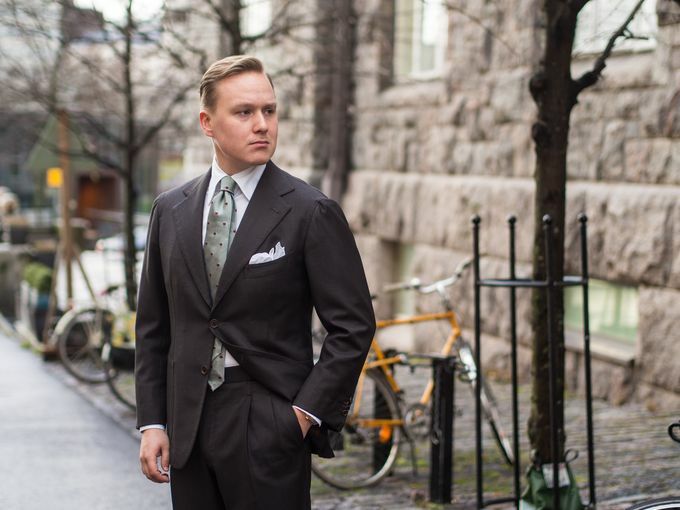 Another part of the suit I cannot stop drooling over is the fantastic lapel with its perfect handmade feel and look. 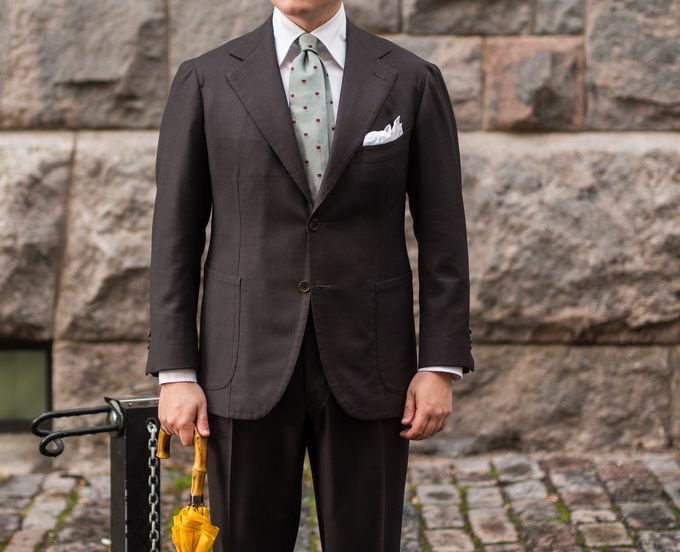 In other details, today's look includes a set of narrow elastic braces in navy and yellow. And why navy and yellow? Because I rarely like to match my braces and usually just tend to go with what ever. 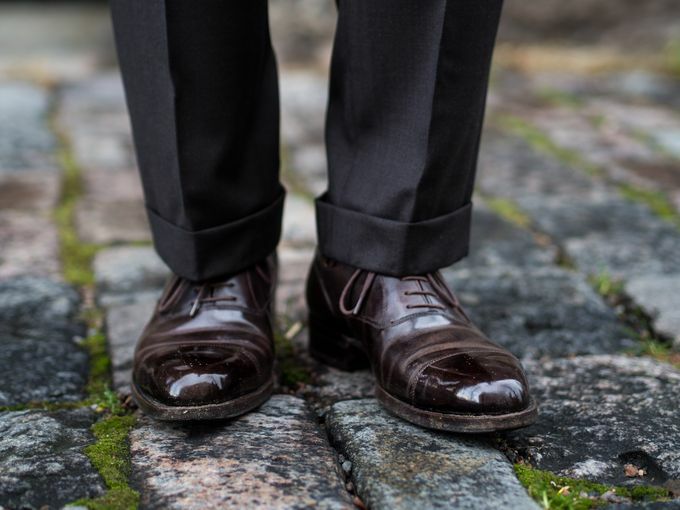 Finally, I'm wearing my dark museum brown Vass Oxfords in the F last, perhaps my favorite pair of shoes for the winter season. 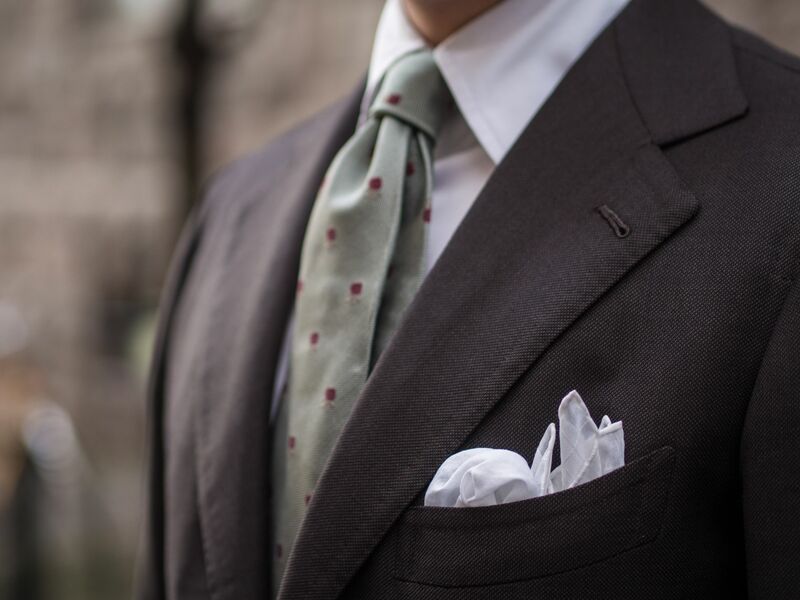 The color is simply perfect dark brown that I like for most formal looks.